2 Westfield State College and Northern Essex Community College have created three transfer articulation agreements between the Department of Economics and Management at Westfield State College and the Business department at Northern Essex Community College in support of a valuable and barrier-free public academic experience. OBJECTIVES: 1. To encourage and streamline the transfer of qualified students from Northern Essex Community College (NECC) to Westfield State College (WSC). 2. To award academic credit for courses completed at NECC that meet the terms of the Business Transfer degree and apply them toward the requirements for the WSC Bachelor of Science in Business Management degree with concentrations in Management, Marketing, and Finance. 3. To provide effective and concise guidelines for students seeking to transfer to WSC. Students will have accurate and clear information regarding the transfer of their course work and credits, both completed and outstanding, as they apply to the Bachelor of Science in Business Management degree at WSC. TERMS OF THE TRANSFER ARTICULATION AGREEMENT: 1. 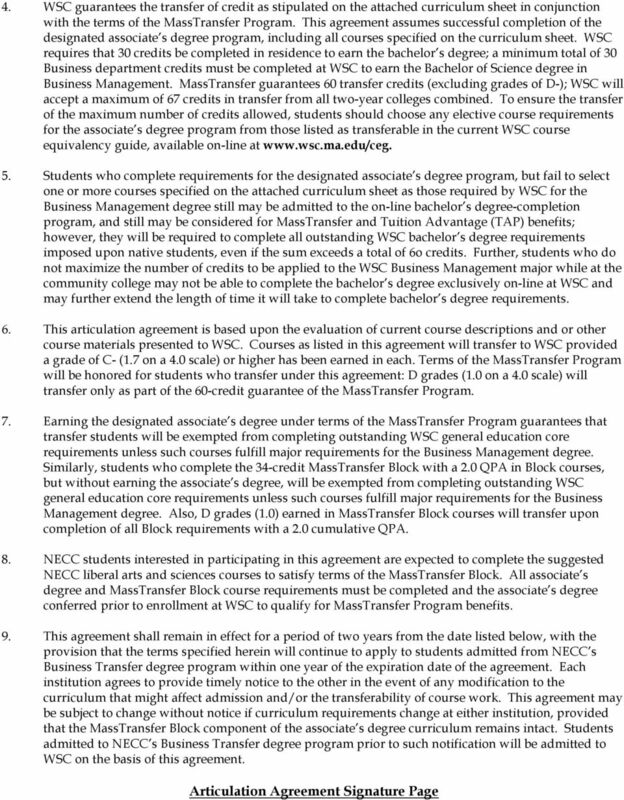 This articulation agreement has been designed to meet terms of the statewide MassTransfer Program, effective for students enrolling at the community college beginning fall 2009 and transferring to the state college beginning fall Westfield State College (WSC) guarantees the acceptance of students who complete the Business Transfer degree program at Northern Essex Community College (NECC) with an overall QPA of 2.50 (on a 4.0 scale) or higher to the Bachelor of Science in Business Management degree (with concentrations in Management, Marketing, or Finance) at WSC. In order to guarantee admission to WSC for a specific term, qualified students must complete the application process on time: the priority filing deadline for spring semester enrollment is October 15; the priority filing deadline for fall enrollment is March 1. Qualified students who complete their application files after these dates will be accommodated on a space-available basis. If space is not available for the requested enrollment term, students may be guaranteed enrollment for the following term, upon timely request. On-campus housing is not guaranteed as part of this agreement, nor is it available to students who enroll through the Division of Graduate and Continuing Education (DGCE). 2. Students may be admitted to WSC under terms of this program-to-program articulation agreement via either the full-time undergraduate day division (Admission office) or the Division of Graduate and Continuing Education (DGCE). However, students may not request on-campus housing through DGCE; consequently, students who wish to be considered for on-campus housing must apply through the full-time undergraduate day division. Further, full-time undergraduate day students that either commute to or live on the WSC campus and partake in campus life may be able to register for some online courses, but will not be allowed to build class schedules comprised exclusively of on-line courses. DGCE will enroll students on either a part-time or full-time basis for the exclusively on-line bachelor s degree-completion program in management. 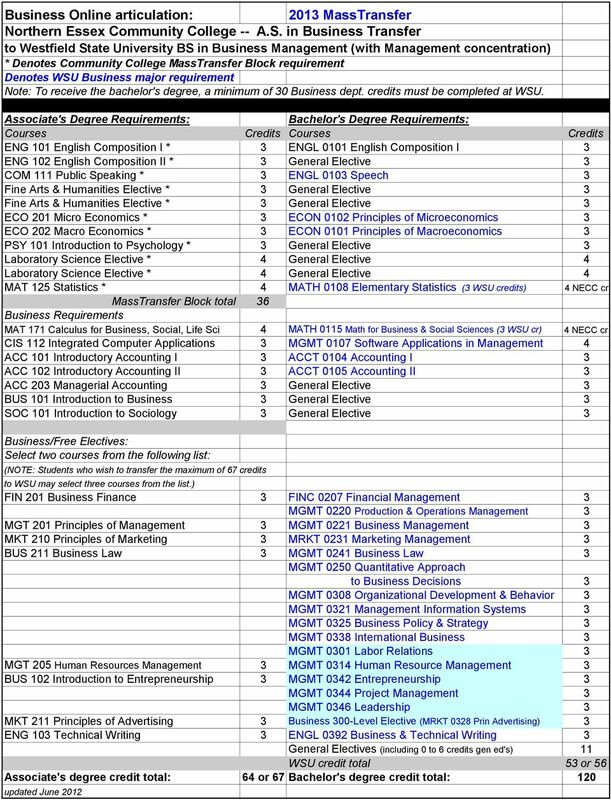 Students applying to DGCE will enroll under terms of this explicit agreement and complete the management degree entirely on-line, as specified in the attached curriculum sheet. 3. Students enrolling through DGCE that qualify for enrollment under terms of this agreement will be afforded the benefits of the MassTransfer Program: they will apply for admission via an on-line application form that does not require a fee; they will be guaranteed admission to the exclusively online bachelor s degree completion program if they complete their application files by the priority filing deadlines and have a cumulative QPA of at least 2.50; and, they will have the Tuition Advantage Program (TAP) discount built into their fee structure for full-time on-line attendance (12 or more credits per term). MassTransfer students enrolling through the full-time day Admission office are subject to the TAPeligibility standards and practices set by the Massachusetts Department of Higher Education. 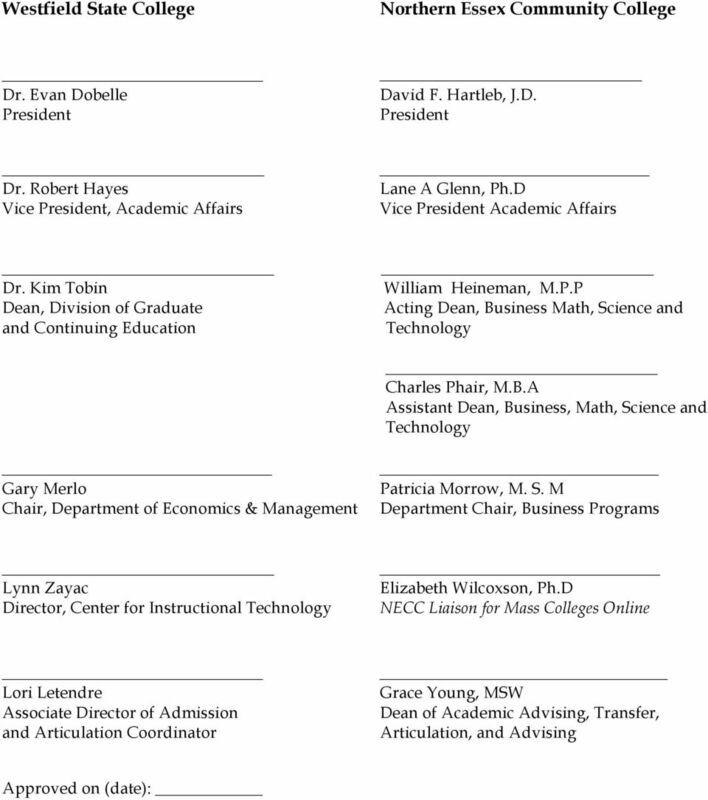 ARTICULATION AGREEMENT. Between the. ASSOCIATE IN SCIENCE DEGREE Computer Science Transfer PROGRAM. Northern Essex Community College. 2. John Jay College will accept up to sixty-eight (68) semester hours of academic credit toward fulfillment of the bachelor s degree. 2. Courses completed at Montgomery County Community College with a minimum grade of"c" will transfer. a. Definitions. Articulation Criteria and Articulation Benefits are defined on Attachment A hereto.